Do you know what stickiness is? It’s the quality that every SaaS product needs in order to ensure customer retention and build their customer base into brand evangelists. Which begs the question, what are brand evangelists? They are the drivers of your message and your best source for quick and easy sales closes. They’re the customers you’ve nurtured from new acquisitions, to fans, to heartsick puppydogs for your product. They love your product. In fact, they can’t imagine their work day without your product in their lives. If they were angst ridden 16 year olds, they’d have your logo etched on their backpack with a heart around it. And more than anything in this world, you should want as many brand evangelists as you can get. Creating brand evangelists isn’t easy. If it was, everyone would have them. Instead, most companies simply have clients. That’s it; plain, white bread, never-gonna-promote-them clients. And those companies have no idea what they’re missing out on. Brand evangelists will tout your product at trade shows, to their colleagues, and will engage with you on social media as if you were a rockstar in your industry. 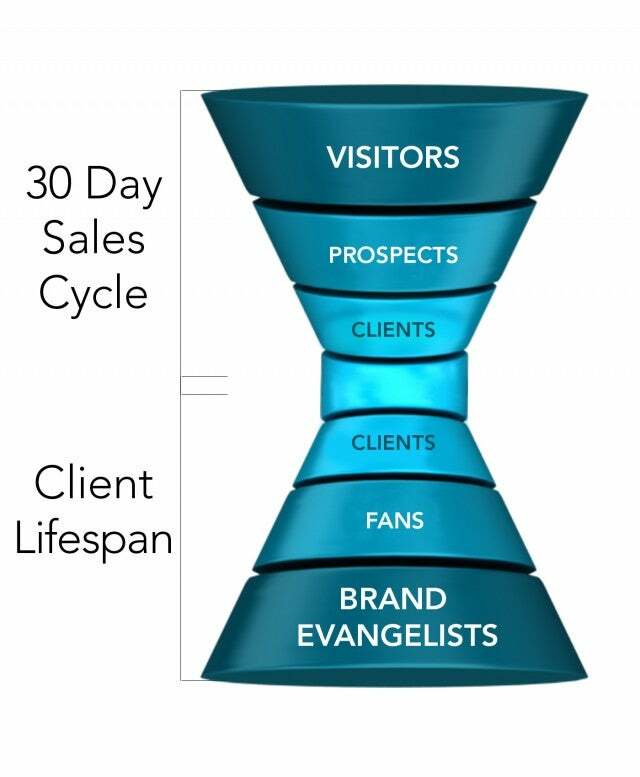 So, now know that you want brand evangelists, what’s the process to get them? Now that you’ve closed your client, you need to continue marketing to them. Content that you create for your outbound messaging, should be repurposed and customized for your existing customers. You’re constantly trying to show your potential clients your value, but why on earth would you stop doing that once they become your clients? Instead, you should continually be building value with your clients. So, use your content properly and disseminate it freely to your customer base. You’ll want to host “client only” webinars. Have social chats with your clients where they can Q&A with you in an open and organic environment. Send your clients eBooks from partners that you think would help with a pain point they’re experiencing. Just keep giving. No matter what you do, you should give, give, give until it hurts. Your clients will love you for it. Do you know how to avoid putting out fires with your clients? It’s Simple. You just need to keep them informed of everything. Give them so much information that they should feel the need to ask you to tone it down a bit. Why? You’re not selling them anything. You’re keeping the abreast of anything that affects their business and giving them value adds along the way. It’s like having a friend that leaves your favorite candy bar on your doorstep every night. Eventually you might end up with a stash of them and you would politely thank them, but let them know it’s not needed at such a regular schedule. So, if they wanted to drop off one candy bar every week that would be great. Would you ever get angry at that friend? Hell no! You’d love them for the thought and the effort. And once you’ve established the proper schedule, they’d quickly become one of your favorite people. The same holds true for your clients. Go and look at any survey on customer dissatisfaction. I can absolutely guarantee you that there isn’t a single answer that was given that stated they were dissatisfied because the company was “too helpful”. So, touch your customers on a regular basis (if that made you giggle, you need to grow up). They’ll never call you in a panic and need you to put out a fire, and they’ll begin to relate your touches with good news. This will have a Pavlovian effect on your clients and they’ll soon eagerly await your next email or phone call. This also holds true for negative news as well. Don’t just feed them sweets. Instead, make sure that your clients are aware of any issues that might have an effect on their business. * A friend of mine emailed every client they had when an update screwed up a few of their lesser used features. The issue probably would have flown under the radar without anyone noticing, but he wanted to make sure he headed off any potential problems. He was overwhelmed with customer responses thanking him for the heads up and commending him and his company on being upfront and honest with his customers. I can guarantee that he created a few brand evangelists that day. By being in constant contact with your clients and continually showing them the value of your product, you’ll create a culture in your customer base of heavy usage. Your product will become an integral part of their daily business operations. This will ensure that when budget constraints occur, your product is one of the last items they’ll discuss when it comes to cuts. This will cause your retention rates to go up dramatically and your churn rates to plummet. The admiration your customers develop for you won’t go unnoticed. Others will see their fanaticism and it will make them think that there must be something about your company. So they’ll dig deeper and seek you out. They will already have a vote of confidence in your work because they came across one of your brand evangelists. This makes this potential client a much easier close for your sales team. You get the point. They’ll proclaim your value to everyone at the new firm, and without spending a penny in marketing dollars, you’ll have a new client. So stop fretting about ways to improve retention, usage, and re-order rates (stickiness). They can all be accomplished by running a solid client nurturing campaign. And as an added benefit to the improved metrics, you’ll have created thousands of new brand evangelists.